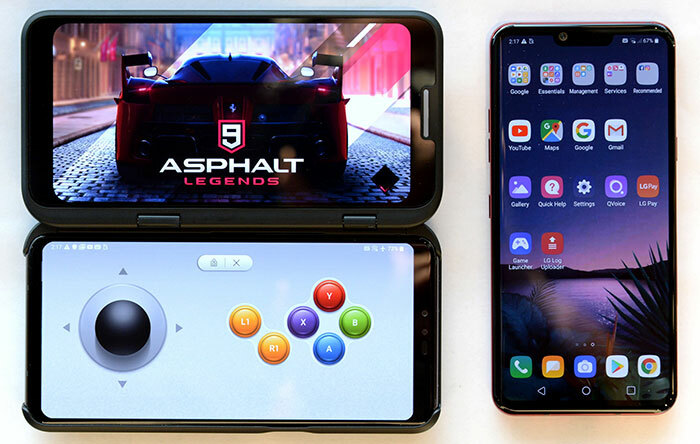 LG unveiled a pair of "groundbreaking" new smartphones at MWC 2019. In brief, the LG V50ThinQ 5G was heralded as being among the first to bring a 5G experience to consumers, while the LG G8ThinQ refines the G-series flagship proposition with tech such as 'Air Motion' controls, palm-vein biometrics, an advanced 'Z' Camera, and its rounded audio/visual prowess. Both these smartphones are powered by the Qualcomm Snapdragon 855 processor and offer 6GB RAM / 128GB / microSD (up to 2TB), have >6-inch OLED screens, and super-wide/wide/telephoto triple rear camera arrays. Ahead of MWC we heard that LG wasn't going to attempt to compete with Samsung and Huawei with a foldable phone but would bridge the gap between smartphone slab and foldable with an attachable screen. This has materialised as the Dual Screen for LG V50ThinQ 5G. 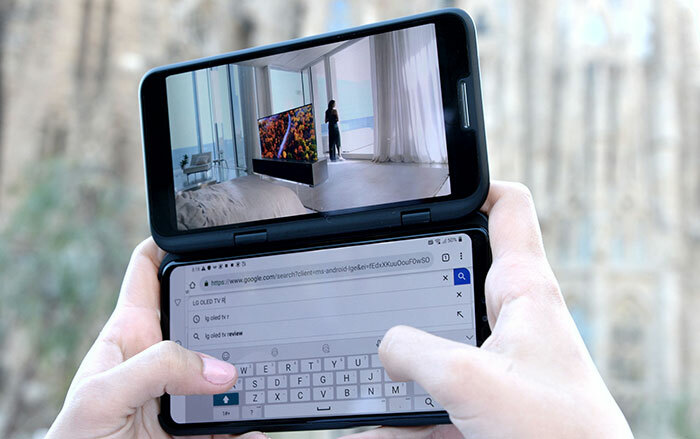 While the LG V50ThinQ 5G has a 6.4-inch OLED 3120 x 1440 pixel screen its Dual Screen companion offers 6.2-inch OLED 2160 x 1080 pixels. As you can see in the pictures the bezel on the attached screen is not insignificant. This is definitely a dual-screen and doesn't try and present any kind of continuous vista to the user - apps can't span both screens for example. 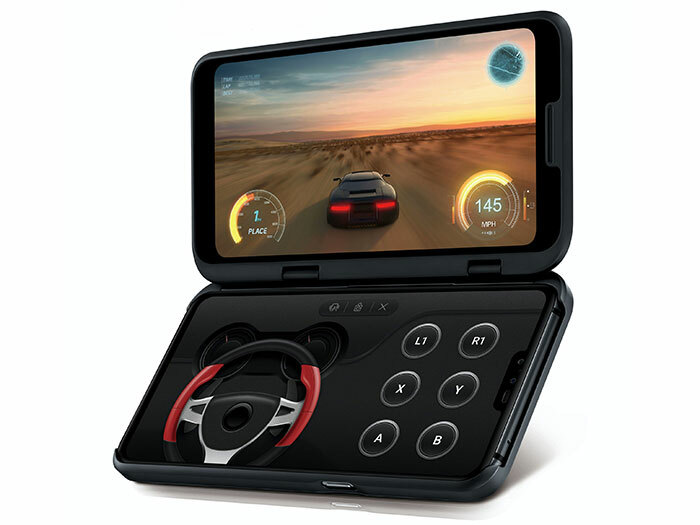 As well as its multitasking attractions (hosting up to 4 apps), the dual screen setup can be used in a Nintendo DS style mode with the controls hosted on the LG V50ThinQ 5G and gaming action on the attached screen (note that both screens are touch-enabled). Another example image shows the phone screen being used for text input. In use, the Dual Screen can be locked at either a 104 degree or 180 degree angle to the primary display. If you equip the Dual Screen accessory you will be adding 131g to your phone (which is 183g, for a combined total of 314g). LG says that the thickness of the Dual Screen is 15.5mm - and this must be the combined thickness including the phone. 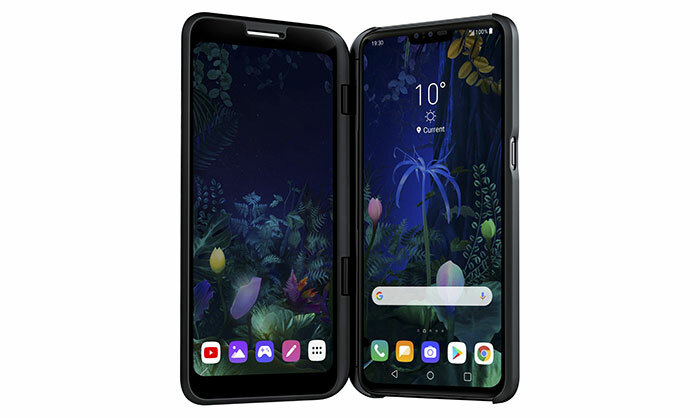 The Dual Screen doesn't pack its own battery, it is powered and communicates with the LG V50ThinQ 5G via a triple pogo pin and draws power from the phone's 4,000mAh battery. The pricing of the Dual screen accessory hasn't been revealed by LG. Is this not what the ROG gaming phone already does? So… We are back at the Nintendo 3DS with more games, bigger display and so on? Its not exactly thin either. It's not exactly thick either, though. A DS Lite is about 4mm thicker and I have no problems with that. This thing is close on my current phone thickness in an Otterbox. Neither make me feel like I'm carrying an Energiser!